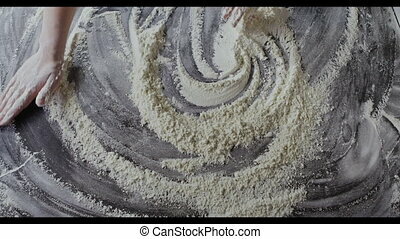 Slowly pouring flour from wooden spoon in a female chef hand on a black background. Slow motion, Full HD video, 240fps, 1080p. Step by step homemade dough preparation. 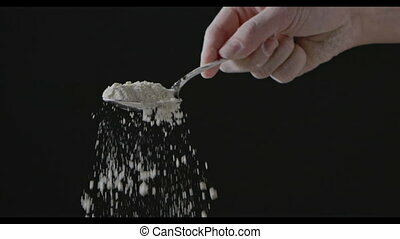 Natural flour is falling from spoon in a girl's hand on a black background. Slow motion, Full HD video, 240fps, 1080p. Process preparing of homemade pastry. Top view of process of preparation natural dough. Woman's hand move fresh flour on a wooden kitchen table. Slow motion, Full HD video, 240fps, 1080p. Step by step dough preparation. 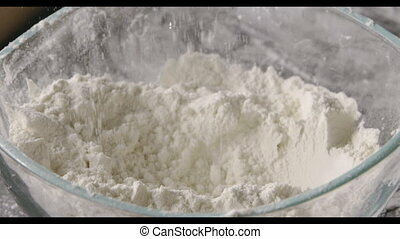 Close up process of handmade dough from flour. 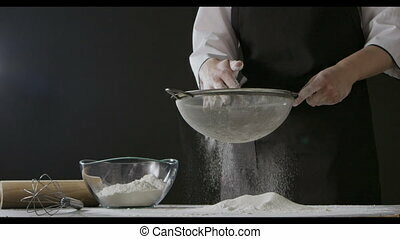 Girl's hand is pouring a white flour in a glass bowl . Close up slow motion, Full HD video, 240fps, 1080p. Process preparing of pastry. Professional chief sieves flour with sifter on a dark wooden table on a black background. Rolling pin and whisk on a table. Slow motion, Full HD video, 240fps, 1080p. Step by step dough preparation. 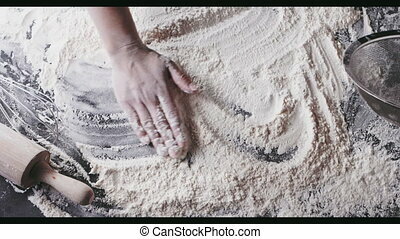 Chef woman's hands gather fresh natural flour on kitchen background. Slow motion, Full HD video, 240fps, 1080p. Step by step homemade dough preparation. Top view. 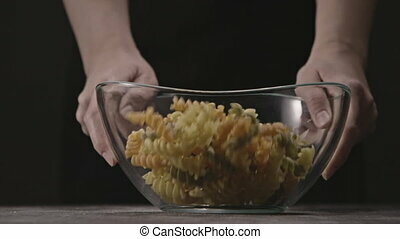 Female's hands moving toward big glass bowl with falling colorful italian pasta Rotini on a dark wooden background on a black. Slow motion, Full HD video, 240fps, 1080p.